“This release is made up of Gustav Holst’s early orchestral music and, as ever, it is enlightening to hear the immature work of a great composer (which Holst most certainly was). The ‘Walt Whitman Overture� shows an undigested Wagnerian influence�The orchestral writing is confident nonetheless, particularly the composer’s adventurous use of the brass within the orchestral texture.�the ‘Cotswolds� Symphony is enjoyable as music per se and, as with the overture and the even earlier tone poem ‘A Winter Idyll� , Holst’s technical assurance impresses. The only piece on this disc to bring us a recognizable Holst is the ‘Japanese Suite’…In this work�we start to hear those transparent textures and persistent ostinati that speak of the composer’s mature style. Exotica it may be, but Holst shows genuine sensitivity in his representation of Japanese music. “’A Winter Idyll�, the Walt Whitman Overture, and the ‘Cotswolds� Symphony, all effectively apprentice works�owe much to the example of the great German Romantics�.Falletta’s performance improves on the earlier [recordings] in every way�.she convinces one that the symphony is much more than just a frame for the moving elegy for socialist visionary William Morris that comprises the second movement. Falletta similarly finds new depth in the transitional symphonic poem ‘Indra�, emphasizing atmosphere and warmth�.The ‘Japanese Suite� is the one work here that is representative of the mature Holst, to the extent that any work can be said to represent a composer who notoriously hated to repeat himself. It reflects his developing interests in things Asian, and in folk music, and it shows him free of the old-school German romantic model. “The tone poem ‘A Winter Idyll� was composed in 1897. It establishes a mood similar to the first movement of Tchaikovsky’s First (‘Winter Dreams�) Symphony, only to quickly vitiate its effect by a second subject group that could just as easily be called ‘Spring’s Arrived�. The style of the piece mixes Brahms and Wagner, with an almost classical clarity, balancing of content, and effective use of three-part texture�.The ‘Walt Whitman Overture� and Symphony in F reveal Holst as a remarkable orchestrator even as early as his RAM years. He uses full sections, smaller groups, and individual solo instruments (especially the brass) excellently and idiomatically. He thinks in terms of specific instrumental colors. His textures are always clear, and counterpoint comes naturally to him. 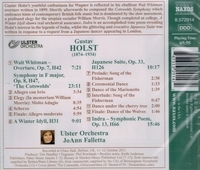 I’ve never heard either JoAnn Falletta or the Ulster Orchestra in Wagner, but I’ll bet they could get the right sound without any apparent effort. Theirs is a transparent approach to Holst’s coruscating orchestration rather than a massive one, with an emphasis on momentum, rhythmic clarity, judiciously flexible phrasing, and well-balanced inner parts. “The Overture�is an exciting piece of music that deserves an occasional airing at orchestral concerts. [In] The ‘Cotswolds� Symphony�The ‘finale� is a joy to behold�this is a well-written piece of music�All in all it is an interesting work�What is most remarkable about this work is the sheer brilliance of the orchestration. The sound quality of this disc is excellent—as is expected from Naxos. The Ulster Orchestra under their Principal Conductor JoAnn Falletta give an authoritative account of these scores. "JoAnn Falletta is an internationally celebrated conductor and champion of American symphonic music. She serves as the music director of the Buffalo Philharmonic Orchestra and the Virginia Symphony Orchestra, principal guest conductor of the Brevard Music Center and artistic advisor of the Hawaii Symphony. Ms. Falletta has guest conducted over a hundred orchestras in North America, and many of the most prominent orchestras in Europe, Asia, South America, and Africa. She is the recipient of many of the most prestigious conducting awards and a champion of music of our time, introducing over 500 works by American composers, including more than 110 world premieres. A leading conductor, her discography includes over 90 titles and her discs have won two Grammy Awards and ten Grammy nominations."